With security forces in Bahrain attacking protesters and dragging doctors from their beds, it has emerged that Nottingham-based arms company Heckler & Koch has supplied 13 000 rounds of small arms ammunition to Bahrain. The ammo was for H&K rifles and submachine guns, which have been used by Bahraini police against the democracy movement in the last few weeks. Although the sale took place before the current wave of unrest began, H&K cannot have been unaware of the repressive nature of the Bahraini regime. 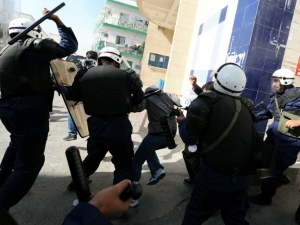 In 2009, the year the ammo was supplied, both Amnesty International and Human Rights Watch reported that Bahraini police were carrying out abductions, torture and beatings of political activists. By arming repressive regimes such as this, H&K is complicit in the human rights abuses they commit. The company has an international sales office in Nottingham, which has been the target of numerous protests in the four years since it was discovered by local anti-arms-trade campaigners.